The simplest answer is we were created for it. The first time we see a man and a woman in the old stories of humankind, we find them in a garden. 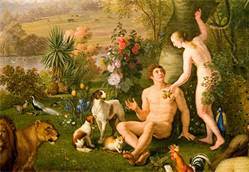 We find the first people recorded in the records of Sumeria, Akkadia, and Caanan in the Garden of Eden, given the responsibilities of gardening there by the Elohim, who created them. The stories tell us that when they were turned out of the garden into the wide world they were still sent out to garden, raise crops, and shepherd flocks of animals. Agriculture allowed the first cities to develop around the world, and allowed for the accumulation of wealth and for specialization as a few farmers fed many people doing other things- like writing. According to the indigenous people of the Earth, the first people weren’t turned out of the garden at all. The whole Earth is our garden, and we are its stewards. Their attitude towards the land is one of sacred cooperation and stewardship. They still walk with their gods in harmony and participate in the natural cycles of our planet home. They call the Earth “Mother”, and believe the soil is her body and the waterways her blood. The wind is her breath, and her bounty is a gift to us, her children. And so even today, fed as we are by big agro-business conglomerates, we still have the urge to cultivate the Earth and appreciate her beauty. Whether tending a pot of basil and a few flowers on a small balcony, or digging up our suburban yard to plant roses and tomatoes, many of us have a deep need to garden. Many of us want, and need, to “put our hands in the dirt” on a regular basis. Being a part of the processes of nature brings a beautiful sense of wholeness and peace. Our great grandparents and grandparents gardened to survive. Many fed their families from “Victory Gardens” during the World Wars and economic depression. Before then, families commonly raised their own meat and vegetables because there weren’t grocery stores to provide it across much of our country. Guerrilla Gardening in Los Angeles allows residents to create gardens on abandoned and unused land. 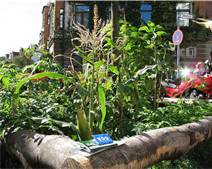 “Guerilla Gardening”, beginning in LA, is spreading across many of our blighted cities to feed the hungry families living in “food deserts” where wholesome, fresh food in largely unavailable. Volunteers cultivate abandoned and city owned land producing fresh fruits and vegetables for their communities. Land once covered in trash and urban blight is made to bloom again. What was ugly becomes beautiful and alive with bees, butterflies, birds, and gardeners. The gardeners find nourishment for body, mind, and spirit. Even roof gardens have been created in New York and other cities to raise crops of fresh vegetables and herbs in raised beds. Some have their own bee hives both to pollinate the vegetables and produce fresh honey. City dwellers buy subscriptions to support the costs, and in return receive deliveries of seasonal produce each week. Some of these programs train urban youth to farm, work with troubled youth, and encourage their subscribers to volunteer at the roof top farm and build community. So, why do we garden? This is a very personal question for each individual gardener to keep in mind. The answer may change, subtly, season to season, and garden to garden. While we may need to garden to provide food for ourselves and loved ones, many of us live near farmer’s markets and grocery stores, and have the ready cash to pay for the food we eat. It may be far easier to buy our tomatoes than to raise them. Yet we still want to garden. The suburbs of America are filled with single family homes surrounded by lawns, foundation plantings, and a few scattered trees. This has been the norm since the 40s and 50s, and is even enforced by covenants in some communities. Throughout the summer months families pour chemicals onto the lawn to kill weeds and fertilize the grass, run sprinklers several times each week to keep the grass watered, and then run lawnmowers to keep the grass neatly cut. Our waterways are polluted with chemical run off, and the air is polluted with noise and exhaust from the gasoline engines of mowers and trimmers. This is gardening, and the green lawn and tidy bushes bring great satisfaction to many. Beyond food, many of us crave beauty. Some find satisfaction in the symmetrical beauty of a green lawn bordered with box or yew; others want a border of flowering shrubs, perennials, and herbs. Others of us find beauty in the shady green or a forest, or an expanse of gravel, rock, and alpine wildflowers or succulents in a rock garden around our home. When beginning to work with the land around our home, we need to consider what we want in return for our investment of time, treasure, and attention. Focusing on our own needs first helps us make good decisions about what to buy and how to proceed. 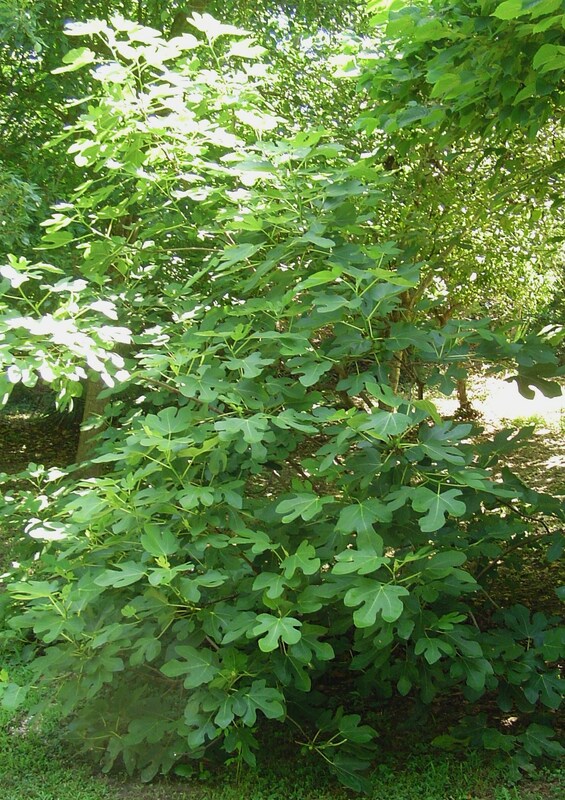 This fig will live for many years, producing figs over a long season. If we want to produce some or all of our own food, we need open areas of full or partial sun. There are a number of perma-culture crops which are planted once, and then harvested for decades to come. These require a dedicated space, good soil preparation, and time. Many won’t bear produce for several years after planting, but must be watered, weeded, and protected from wild life as they mature. Many of these crops not only produce a crop, but are also beautiful “bones” in a landscape. It is wise to plant these during the first year or two on a new property to allow them time to grow and fill in. All require adequate space based on their mature height and spread. Examples: rhubarb, asparagus, Jerusalem artichoke, running onions, blueberries, blackberries, raspberries, kiwi, fig, gooseberry, currant, apple, cherry, peach, plum, pomegranate, persimmon, pecan, walnut, hickory, hazel, orange, lemon. Not an exhaustive list, this offers an overview of permanent landscaping plants which produce a crop. To grow annual crops, we also need areas of full sun (usually 8+ hours a day). Whether we build raised beds, grow in large pots, or till up a traditional garden, this space should be dedicated early on in garden planning. What do we want to grow, and how much do we need? Families who want to depend on their own organically grown produce year round will dedicate enough space to grow large quantities of food to can or freeze. Others might only want to grow a few premium crops like fresh herbs, lettuce, tomatoes, and blueberries, or grow crops not easily found at the grocer, like Malabar spinach. If we enjoy flowers indoors, we’ll grow a cutting garden of flowers and include shrubs for the green bones of our arrangements. We might grow a raised bed of zinnias or tea roses for cutting, or grow flowers among our vegetables to attract pollinating insects. 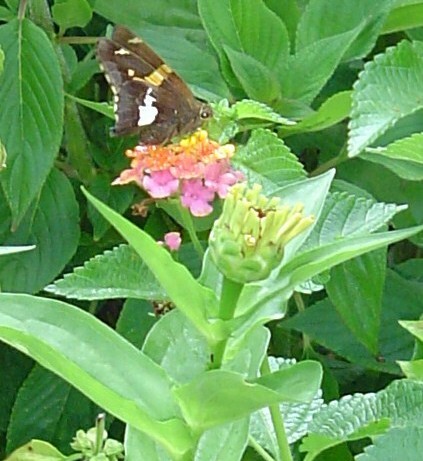 Zinnias and Lantana feed hummingbirds and butterflies, but are ignored by the deer. 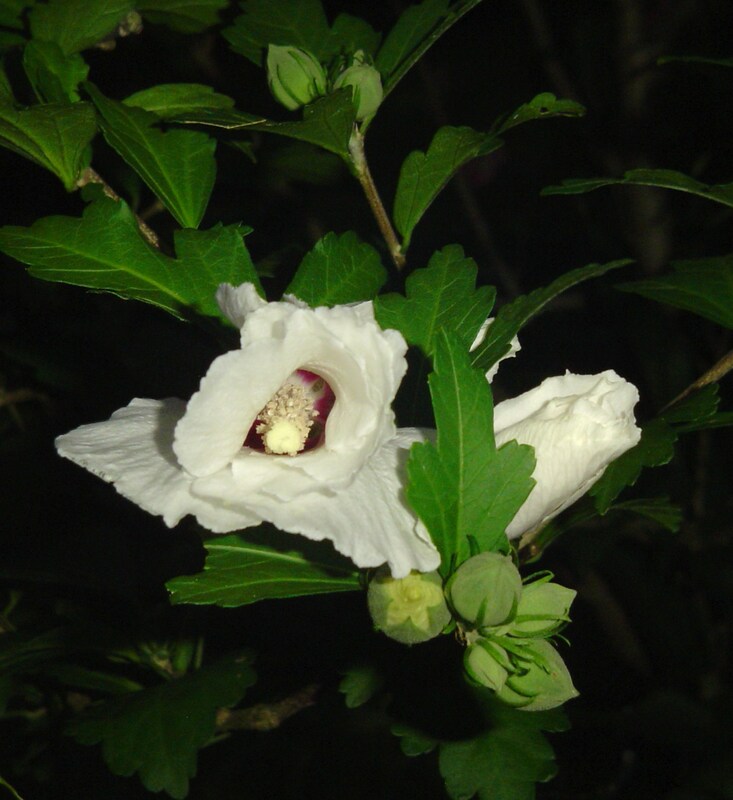 Rose of Sharon flowers close each evening, and open fresh each morning. If we are gardening to create a beautiful landscape, our choices will be different. 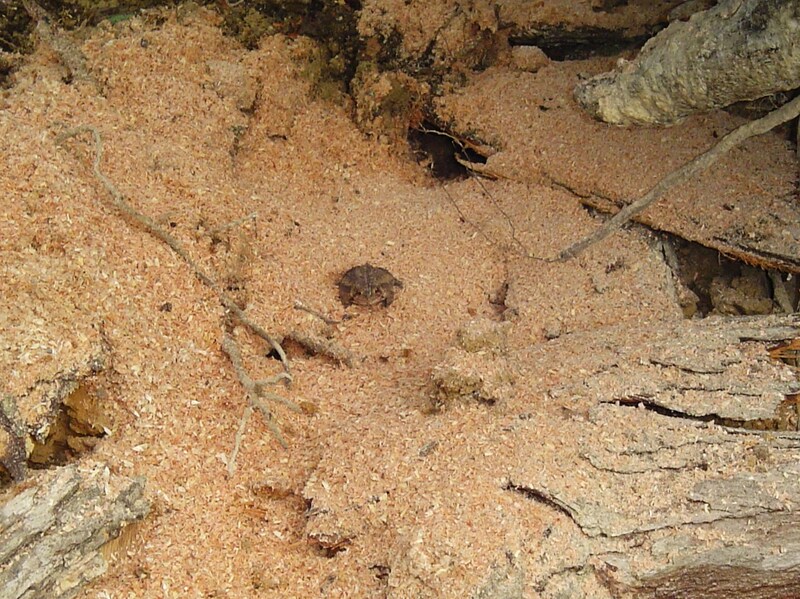 Maybe we don’t want to pick up an annual crop of pecans, or clean up fallen apples each fall. 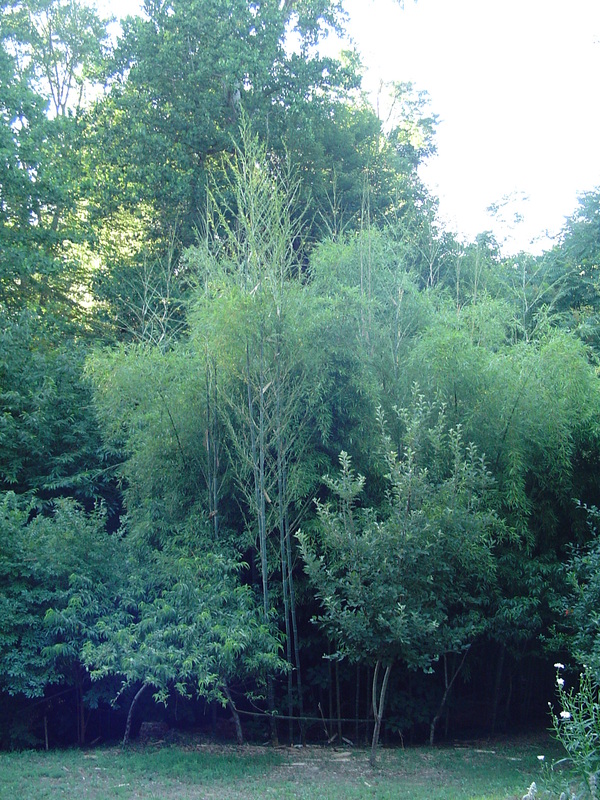 The trees and shrubs we choose for the bones of our garden will be ornamentals. We’ll fill our planting beds with collections of favorite plants like daylilies, iris, roses, Hosta, peonies, daffodils, and phlox. We’ll include pathways to wander and comfortable chairs along the way to sit and contemplate the beauty of it all. Our garden may become an outdoor room where we relax and entertain. We choose tall evergreen shrubs to create a privacy screen; vines growing on a pergola for shade; flowers and herbs for their aroma; and beautiful pots and hanging baskets of flowers as living works of art. Collectors among us will tailor our plantings to include many cultivars of a favorite genus of plants. We want to grow lots of different types of hosta, or many different varieties of rose. When this fits into our overall plan, like growing several different varieties of fig in our perma-culture garden, it makes sense and we enjoy it. The plant kingdom is so large and varied that we can spend a lifetime collecting and still find new plants to catch our interest. An early crop of figs ripens in late June. 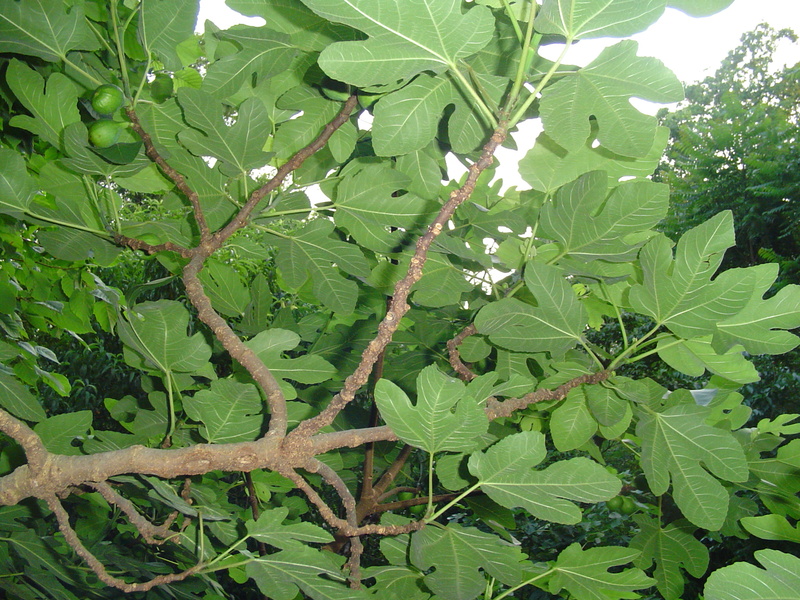 These figs remain green when ripe. Finally, some of us garden to conserve the ecosystem. We work within what nature has already provided to provide habitat for animals and a place of peace and beauty for ourselves. 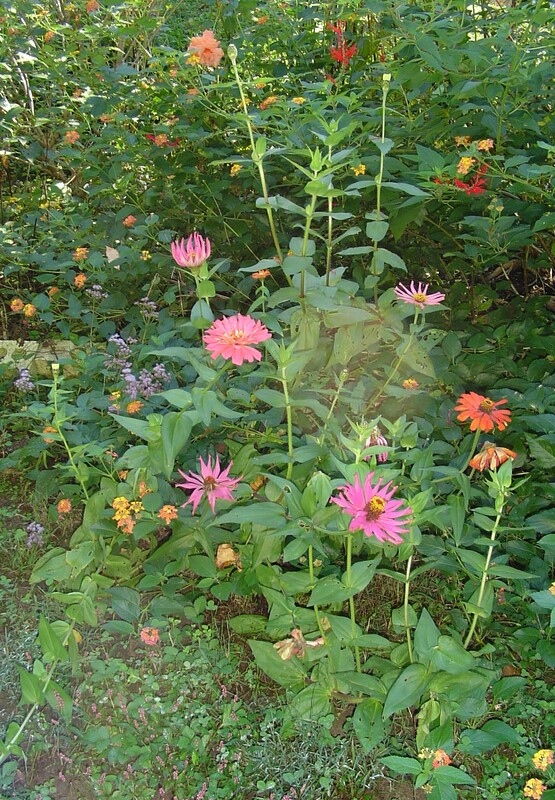 From this perspective, we choose native plants over hybrids, leave as many trees and shrubs in place around our home as possible, reduce areas of lawn, and use non-invasive gardening techniques. Instead of tilling the ground, we build raised beds for planting. Rather than spraying chemical herbicides, fungicides, and pesticides, we set up natural systems to control pests and use non-chemical ways to control weeds. We choose plants which need minimal extra watering, and manage the run off from our home and yard in ways to reduce erosion and increase habitat. 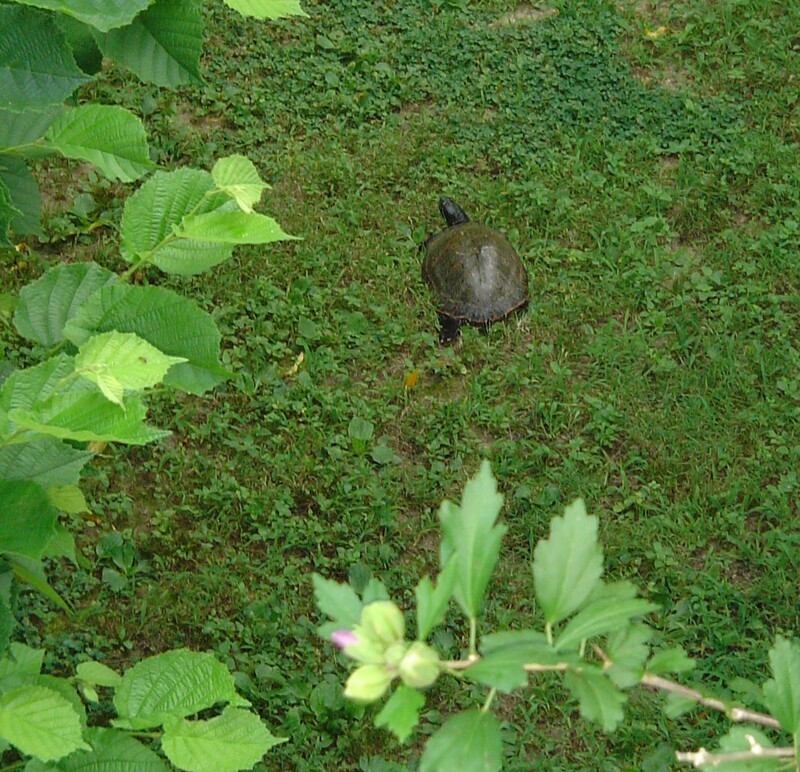 A box turtle explores the back yard, scouting out a place to lay eggs. Birds, bats, frogs, lizards, turtles, and predatory insects are welcome because they all eat insects and so control insect populations on crops and around the garden. Providing safe shelter and a source of water is often all that is needed to attract them. 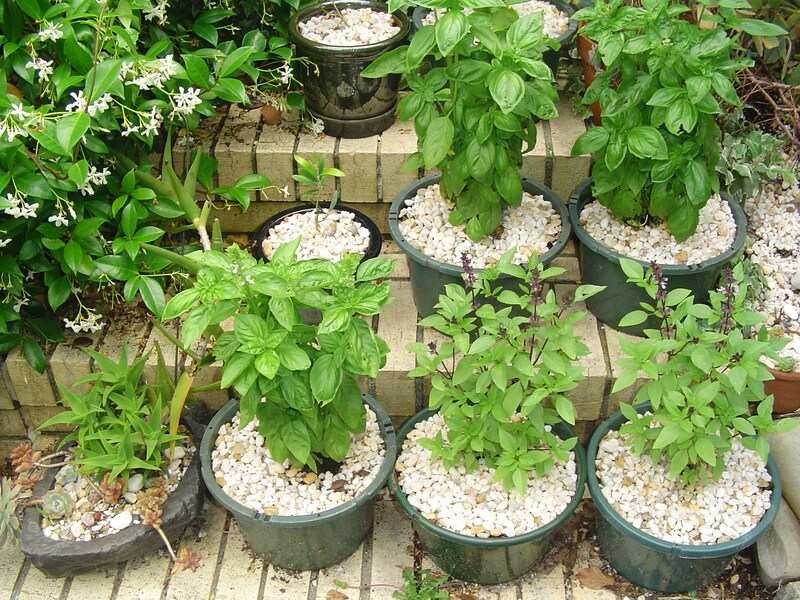 Growing flowering herbs and flowers increases the variety of flying insects and birds that eat them. Birds not only enjoy the feast of insects, but choose to live in yards where there are berry bearing shrubs and cover for them to nest. Gardening with nature can reduce the time and treasure we invest in the garden, as we leave “wild” areas of our yard to the animals, and plant perennials, trees, and shrubs where others might have lawns. 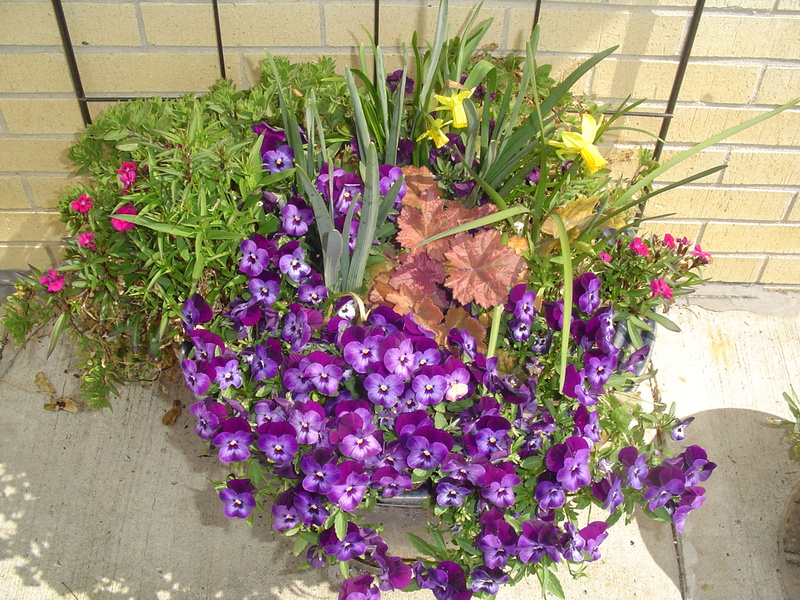 We plant things which are beautiful in all seasons, or which return reliably year after year with minimal care. We fertilize mainly with compost. Grass, leaves, and kitchen waste are composted to feed the soil. We buy less and enjoy more. These purposes for gardening aren’t mutually exclusive. As we begin again with each new garden, with each new season, we find a fresh balance. Our gardens change and evolve as we do. Having a clear idea of what we want from our garden informs the choices we make. Trial and error teaches us how to improve. Enjoying the fruits of our garden, whether edible or ornamental, keeps us coming back again and again. Thanks for following my blog and for all of your helpful tips in your wonderful blog. We have a 4×8 foot raised-bed garden an some areas drenched in shade during the year. I am looking forward to learning how to be more successful by following your suggestions. Thank you. I garden because I believe in miracles! Very well said with so many choices. My choices changed with my way of living. Working 6 days of week only allowed for beautiful flowers. Now, as I retire, I want fresh vegetables and wish I had planted many fruit trees. I now can and save money by buying on sale. Our lives do change as well as our decisions. Thanks for ‘pinging’ on my post about groundcovers. I love your lovely site. There’s lots of stuff that’s different from me (I am primarily and designer and an ornamental gardener) and lots that I think we have in common. It’s going to be very useful. Thank you for taking time to look. I hope you find something useful, and something enjoyable.